Instability of cerebral blood vessels and nerves can lead to abnormal sensitivity of the tissues in and around the head. 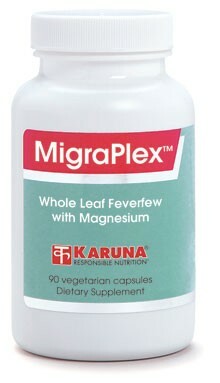 MigraPlex contains two well-researched natural remedies for the prevention of these instabilities. Feverfew herb contains chemical components with significant prostaglandin and serotonin-modifying effects on cerebral vasomotor and nerve activity. Dried whole feverfew leaf standardized for parthenolide content is the most reliable form of this botanical remedy. Magnesium participates in the regulation of vascular tone and reactivity by influencing platelet function, acting as a mild calcium channel blocker, and regulating the effects of serotonin and other neurotransmitters. Standardized feverfew leaf extract contains the active constituent parthenolide, which has been shown to maintain normal blood vessel tone by reducing the release of serotonin from platelets (Lancet 1985;1:1071-4). Feverfew inhibits the production and release of inflammatory chemicals such as prostaglandins and arachidonic acid (Prostagland Leukotrienes Med 1982;8:653-60). In addition to controlling platelet serotonin secretion, feverfew has been shown to reduce platelet aggregation (J Pharm Pharmacol 1990;42:553-7). Controlled clinical research has found feverfew effective for stabilizing cerebral vasomotor and nerve overactivity associated with certain musculoskeletal complaints (Cephalagia 1998;18:704-8). Magnesium participates in the regulation of vascular tone and reactivity by influencing platelet function, acting as a mild calcium channel blocker, and regulating the effects of serotonin and other neurotransmitters (Persp Biol Med 1988;31:526-7). Magnesium supplementation helps increase days without head discomfort according to several controlled clinical studies (Headache 1991;31:298-301; Fortschr Med 1994;112:328-330; Cephalalgia 1996;16:257-263). Suggested use for adults: One capsule, with meals, three times daily, or as directed. Caution: this product is not recommended for pregnant or lactating women.